"41AN2-45, Burial F-2" by Timothy K. Perttula and Robert Z. Selden Jr.
DECORATION: There are seven rectangular engraved panels around the rim. The panels are defined by two vertical engraved lines with four cross-hatched engraved pendant triangles at the top and bottom of the vertical lines. Within the panels themselves are a series of small upper and lower excised triangles or triangular tick marks. A white kaolin clay pigment is rubbed in the engraved lines. Poynor Engraved, var. 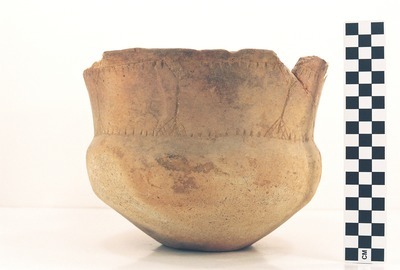 Freeman carinated bowl (Vessel 41AN2-45).